The year was 1953, and America was in love with the Old West. The movies were filled with cowboys, sheriffs, Indians, and gamblers. Kids and adults alike were lining up at the picture show to see anything involving shootouts between the marauders, bandits, comancheros, and thugs that were terrorizing the good decent folks of the Old West, and the heroic lawmen who would bring them to justice. The new entertainment miracle of the times, the television, was bringing these same scenes to the living rooms of those who could afford to buy one. While the lines between good and evil were never so clear in the daily life of those on the real Western frontier, Americans could not get enough of the Hollywood version of the Old West. 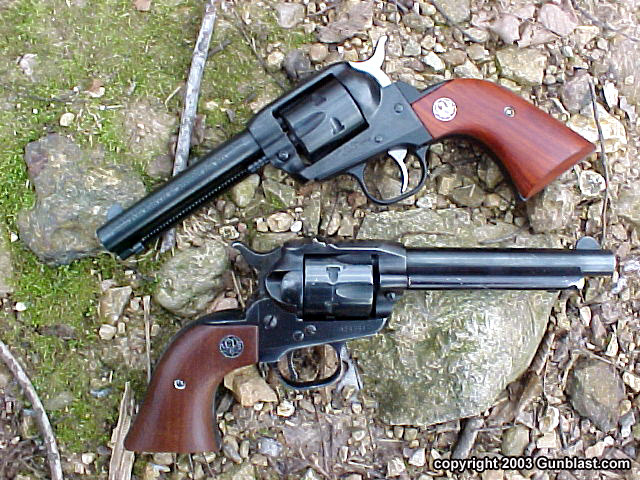 Bill Ruger, displaying his great ability for knowing what the shooting public wanted, realized that there was a market for a new, western style single-action six-shooter. 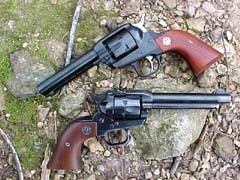 While other gun makers had pounded the last nail into the coffin of the single-action revolver, Ruger introduced to the shooting public what was to become one of the best-selling revolvers of all time: the Single-Six. Ruger took the proven single-action design, improved it with better springs and modern metallurgy and manufacturing techniques, chambered it for the popular .22 Long Rifle cartridge, and sold it for $57.50. That was fifty years ago, and the Ruger Single-Six is still the most popular .22 revolver on the planet. My intention here is not to go into great detail on the history of the Single-Six. That has been covered by our resident Ruger guru, Bill Hamm. 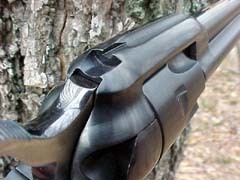 For a very interesting review of the Old Model Single-Six, I refer you to his excellent article in the Gunblast Archives. 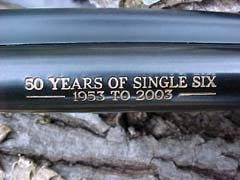 To celebrate the fiftieth anniversary of the Single-Six, Ruger is producing for 2003 a commemorative model. 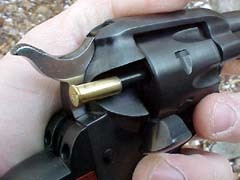 This variation has, of course, the Ruger New Model lockwork that allows the gun to be safely carried with a live round in each of its six chambers. Using Ruger’s transfer bar firing system, the gun cannot accidentally fire if dropped upon its hammer. The Anniversary Single-Six closely resembles the original with its rounded front sight and fixed notch rear. 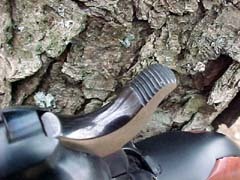 The original Single-Sixes wore a drift-adjustable rear sight, but the Anniversary model has the Vaquero-style of fixed sight that has proven to be very popular today. For comparison purposes, I photographed the Anniversary model with my 1965 vintage Single-Six. I bought my Old Model used a few years ago, and while the finish is scratched and worn, it still shoots as good as ever. 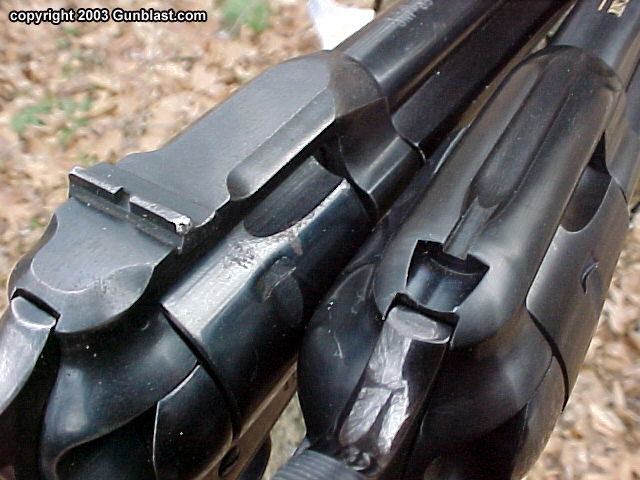 Aside from the transfer bar lockwork of the Anniversary gun, the newer gun as a wider trigger that proved more comfortable for extended shooting sessions than the thin bladed trigger on the old gun. 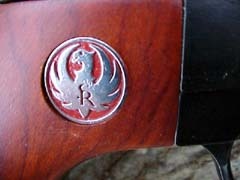 The cocobolo grip panels on the new Ruger have a medallion of the silver Ruger eagle set into a red background. 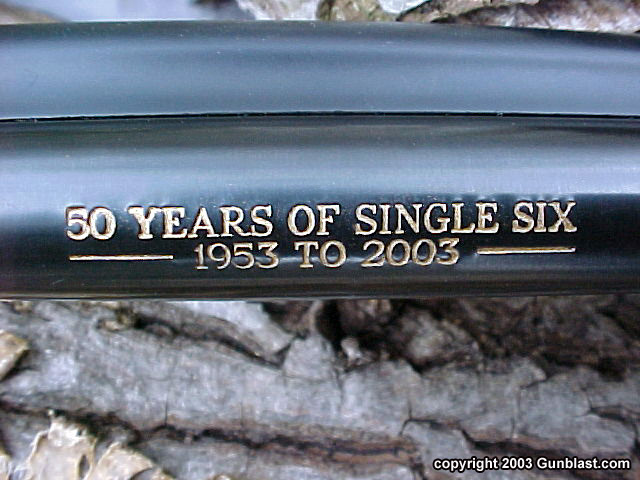 The four and five-eighths inch barrel is inscribed across the top with "Fifty Years of Single Six" over "1953 to 2003", in a gold-colored lettering. Like all New Model .22 caliber Single-Sixes, the test gun came supplied with an extra cylinder chambered for the .22 Magnum. 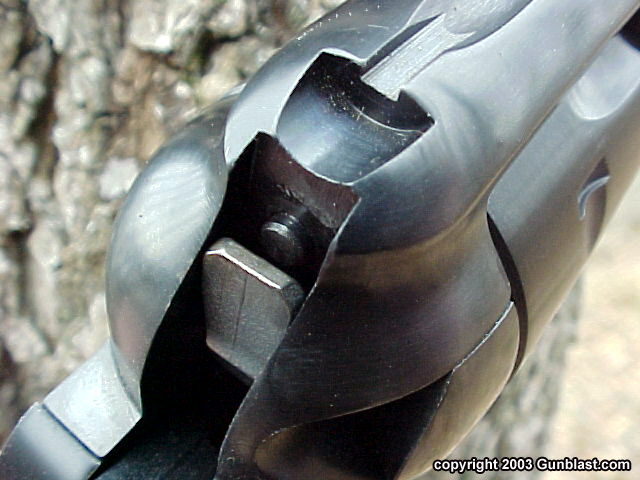 The short barreled Single Six has a wonderful balance, and is a natural pointer. The test gun had a trigger pull weight of three and one-half pounds, and released cleanly, without any gritty feel. 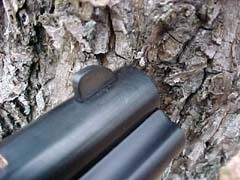 The fixed sights were well regulated to high velocity .22 Long Rifle ammo, and plinking small targets of opportunity was easy. 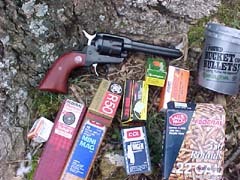 After plinking at small rocks for awhile, I tested the Anniversary Single-Six with a variety of different ammunition. 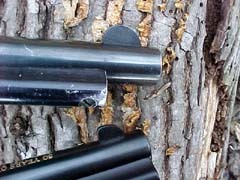 The little sixgun grouped surprisingly well, keeping most ammo under the two-inch mark for six shots at twenty-five yards. Federal hollowpoints sent six shots into one and one-half inches, which is pretty good for me shooting this style of open sights. As expected, there were no malfunctions of any kind. The ejector rod on the Single-Six has plenty of stroke to easily eject empty cases. The standard and magnum cylinders can be easily switched back and forth without tools. The Anniversary Single-Six weighs right at two pounds, and carries well in a belt holster. In the last fifty years many new guns have come and gone. The Single-Six led the way for the great resurgence in the popularity of the single-action revolver, and is still one of the best-selling .22s around. 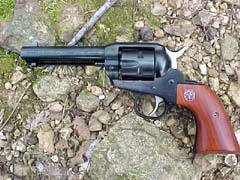 The Single-Six gave birth to the Blackhawk, Super Blackhawk, Vaquero, Ruger Bisley, and countless other sixguns that have been produced by other manufacturers within the past fifty years. For a good .22 for hunting and plinking that will shoot .22 Shorts, Longs, Long Rifle, and Magnums, or to carry loaded with shot shells in snake country, the Single-Six is hard to beat. The little sixgun, given reasonable care, will outlast a few generations of shooters. They are handy, accurate, reliable, and durable to the extreme. The price has risen a bit over the last fifty years, but the Single-Six is still one of the best bargains in today’s gun market. The 50th Anniversary Single-Six comes with the standard and Magnum cylinders, a cable lock, and instruction manual, all packed into a red plastic Anniversary edition box. As an added bonus, it comes with all of the nostalgia of the Old West that you can stand. Ruger's 50th Anniversary Single-Six is a fitting tribute to the gun that launched the resurgence of the Old West-style six-shooter. Compared with an "Old Model" Single-Six, it is apparent that the 50th Anniversary Single-Six truly evokes the sprit of the originals. The most obvious feature of the 50th Anniversary Single-Six is the gold-filled roll mark on top of the 4-5/8" barrel. 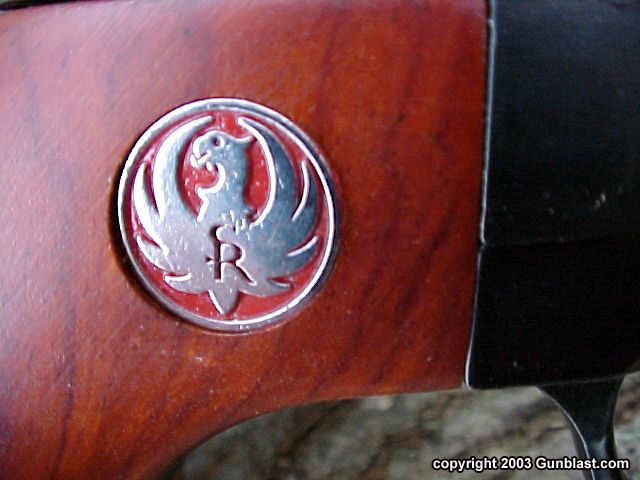 Set into the beautiful cocobolo grip panels are Ruger trademark medallions featuring a silver eagle on a red background. 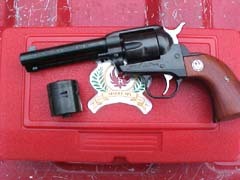 These are the same grip medallions used for the 50th Anniversary .22 pistol, and they are reminiscent of the original red-on-silver Ruger medallions found on the original Ruger .22 auto pistols. The 50th Anniversary Single-Six uses Vaquero-style fixed rear and blade front sight. While different from the drift-adjustable rear and more rounded blade front sight of the Old Model Single-Six, the 50th Anniversary Single-Six's sights give an authentic Old West look. The wider trigger and serrated hammer spur of the 50th Anniversary Single-Six help to make this little gun shoot as good as it looks. 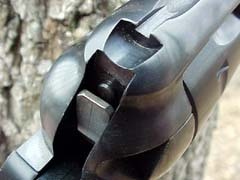 A nice touch is a long-stroke ejector, which makes it easy to completely eject even stubborn stuck cases. 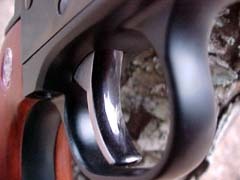 Like all New Model Ruger single-actions, the 50th Anniversary Single-Six features Ruger's transfer bar safety system. As we have come to expect from Ruger, the 50th Anniversary Single-Six proved to be very accurate and 100% reliable with a wide variety of ammunition. 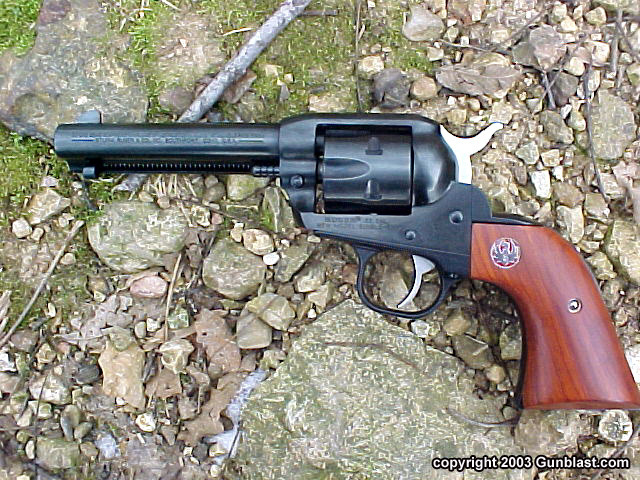 The 50th Anniversary Single-Six comes with an unfluted .22 Magnum cylinder. Like its cousin the 50th Anniversary .22 Pistol, a limited-edition lockable red plastic case with 50th Anniversary insignia is included. We highly recommend this limited-production gun for anyone looking for a fine, reliable .22 sixgun along with a little piece of Ruger history.